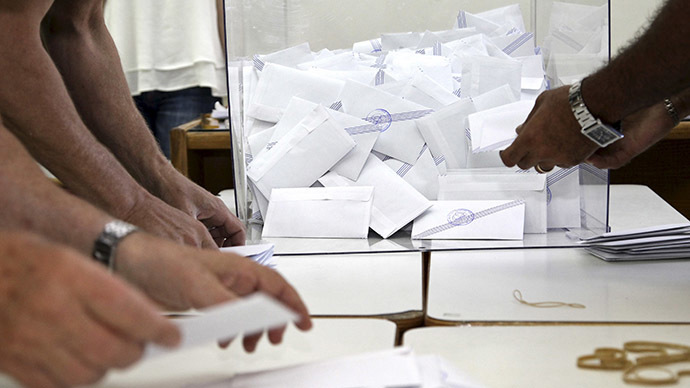 More than 61 percent of Greeks have voted “No” in Sunday’s referendum on the bailout deal and austerity measures, reported the Interior Ministry after 100 percent of the vote had been counted. Thousands of people took to Syntagma square in front of the Greek parliament in Athens to celebrate the ‘No’ vote, which was called “a big Yes to democratic Europe” by the country’s finance minister, Yanis Varoufakis. “As of tomorrow, with this brave ‘No’ the Greek people handed us.... we will extend a helping hand towards our lenders. We will call on each one of them to find common ground. As of tomorrow, Europe, whose heart is beating in Greece tonight, is starting to heal its wounds, our wounds,” Varoufakis said, as cited by Reuters. Greek Prime Minister Alexis Tsipras praised the ‘No’ vote in the referendum, saying that his government is ready to return to negotiations with creditors immediately so that the country’s banks could re-open. “With the difficult circumstances prevailing today you made a very brave choice,” Tsipras said in a televised address to Greeks. “I’m fully aware the mandate you gave me is not one of a rupture with Europe but a mandate to strengthen our negotiating position to seek a viable solution,” he added. Greece’s chief negotiator, Euclid Tsakalotos, expressed confidence that, thanks to the referendum’s result, the country would now be able to reach an agreement with its EU-IMF creditors quickly. “The first thing is that the IMF report proves that the debt [load] is not viable, and secondly that there is a new popular mandate, as it would seem from the apparent result of the referendum,” Tsakalotos told local STAR TV. Greek officials are not discussing the introduction of a parallel currency in the country, he added. “With the rejection of the rules of the eurozone ... negotiations about a program worth billions are barely conceivable,” Gabriel told Tagesspiegel paper. “Tsipras and his government are leading the Greek people on a path of bitter abandonment and hopelessness,” he stressed. The minister’s words were echoed by the head of Germany’s savings bank association (DSGV), Georg Fahrenschon, who concluded that Greece must now leave the euro bloc. However, Italy’s foreign minister, Paolo Gentiloni, urged the EU to keep looking for middle ground with Greece, despite the country’s population rejecting the Troika’s bailout terms. “Now it is right to start trying for an agreement again. But there is no escape from the Greek labyrinth with a weak Europe that isn’t growing,” Gentiloni wrote on Twitter. The “No” victory was predicted by several opinion polls, including GPO, Metron Analysis and MRB, whose results were released after the polls closed. 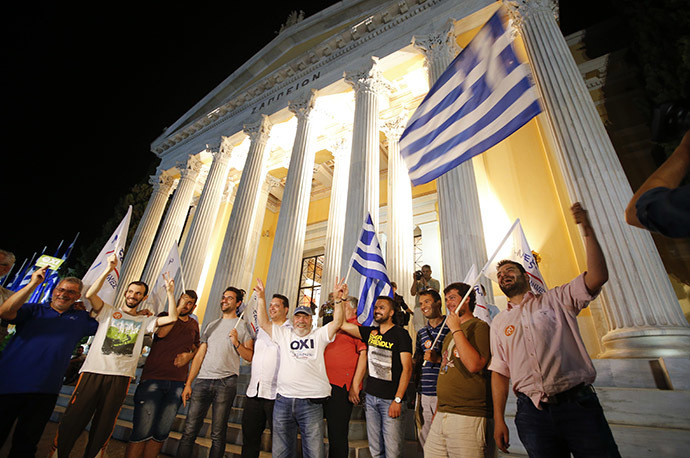 Proponents of the“Yes”vote argued that a“No”vote may lead to Greece’s exit from the Eurozone, and potentially the EU. The talks between Greece and the Troika have been stalled since June, after the Eurogroup declined to prolong a financial aid program for Greece or delay payments on earlier debts. France’s President Francois Holland and German Chancellor Angela Merkel will hold a meeting on Monday to discuss the consequences of the Greek referendum, said a statement from Elysee palace. “The meeting is part of the constant co-operation between France and Germany to find a durable solution in Greece,” said the statement.